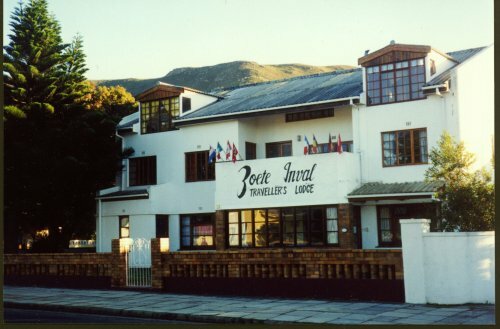 Zoete Inval Traveller's Lodge (South African Grading Council - 4 star rated) provides comfort at budget accommodation prices. The facilities are owner operated in a renovated historical home. There is a serious ECO commitment , with a 'home from home' atmosphere. They are down to earth 'green'. This backpacker's hostel / guesthouse feels like a 'slice of the country' conveniently located 10 minutes walk from the central business district or seaside and 5 minutes walk from Fernkloof Nature Reserve mountain hikes. Accommodation ranges from family rooms and ensuite doubles to basic dormitories. Amenities include: 2 TV lounges, fireside library, balconies, sundeck with outdoor Jaccuzzi(call ahead to ensure it is ready for you), shady courtyard & water feature, self-catering kitchen with BBQ facilities near the veggie/herb garden. Security fenced and remote controlled gated parking for your peace of mind. Enjoy their complimentary health breakfast which consists of: homemade meusli with kefir or milk, fruit in season, assortment of breads/toast with farm fresh jams, spreads, tea or 'real' (filter) coffee. You can order a made-to-order breakfast from their menu. Services include: bookings desk, wifi, computer/SKYPE,meals by arrangement, licensed by the South African Liquor Board, laundry, photocopying - just ask. Hermanus is best known as the 'home of the best land-based whale watching in the world' but it has far more to offer. From July thru December, Southern Right Whales can be seen incredibly close to shore. No need for binocs, just join a guided walk along the cliff paths that stretch from the harbour on the west to the pristine sandy beaches on the east. The mountain backdrop to town provides established hiking trails as well as a mountain top drive for a panoramic view of Walker Bay. The town provides excellent shopping, restaurants & pubs. 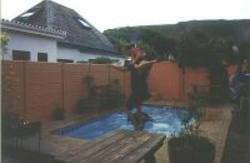 great white shark viewing & cage diving trips, Personalized Tours - Cape Agulhas (southern tip of Africa), wine tours, Hermanus Orientation Tour (for those arriving by public transport) harbour to harbour kayaking trips, boat trips to the whales, abseiling, adventure hikes, horseback riding (beach or mountain rides), local wine tours (are a MUST! ), township tours, scuba diving, and more. We can organize: airport transfers, bus tickets, shuttle services, discount membership cards and more. As well as being eco-friendly (check out the recycle system and worm composting). The owners are committed to the support of local community. Check out the 10 year young, Recycle 'Swop' Shop (www.recycle-swop-shop.co.za) where kids can bring tins and bottles to swap for things they want and need. If you would like to help, consider bringing used kids clothes & shoes in that bag you will take home full of souveniers. * A 1.5 hour's drive south east of Cape Town on the N2 highway, take the Botriver exit to Hermanus. * A scenic 2 hour drive along the coastal R43 via Stony Point Penguin Colony and Harold Porter Botanical Gardens east of Cape Town. * As you arrive, two blocks east of Gateway Shopping Centre at the corner of Flora Avenue and Main Road.